Dr. Elias Wirtham is a humanitarian about to re-open a free clinic to treat the city’s less fortunate. The re-christened H.E.A.R.T. Clinic (Hospital for Emergency Aid and Recuperative Therapy) is located in the building that formerly served as a front for Mister Negative’s criminal empire. The crime lord used the facility’s good works to hide his evil endeavors. Now Dr. Wirtham will treat New York’s poor ill and infirm while as Cardiac he will use the clinic’s remaining hidden passages to conduct medical procedures that have not been approved by the F.D.A. – procedures he deems medical miracles. He and a team of like-minded doctors work tirelessly healing the forgotten of society with experimental technology. When a little girl with severe brain damage requires a device that can only be procured by stealing it from Yardale Storage, the police impound for items seized at superhuman crime scenes, Cardiac crosses paths with The Superior Spider-Man. Peter is on the verge of a breakthrough in regaining control over his body from Doc Ock. Before being awakened by the patrol app on his phone Peter attempts to move his hand while his body under Doc Ock’s control slumbers. His attempt at scribbling a note is less than successful and he knocks his notebook into the trash can as Doc Ock wakes to go on patrol. Upon reaching Yardale Storage (also known as the Boneyard), Spider-Man orders the responding police officers to maintain a perimeter and leave the super-powered criminal inside for him to deal with, effectively relegating them to security guard duty. Once inside Spider-Man makes quick work of subduing Cardiac. He is about to pummel the apprehended culprit mercilessly when he hears a voice shout “Stop right there!” The voice belongs to Peter Parker. Taken aback by the outburst in his head, Spider-Man allows Cardiac to regain his footing. Single-minded the doctor redoubles his efforts to obtain the device that has brought him to this place. There amidst the wreckage of crushed and battered evidence containers Cardiac finds exactly what he is looking for. But there is no way Spider-Man is going to allow him to leave with it, especially when he finds out that the object in question is one of his own technological breakthroughs, a neurolitic scanner, the device that allowed Doc Ock to communicate with his mechanical arms. He attacks Cardiac with renewed vigor and intensity, pinning him to the floor. All set to demolish Cardiac’s face, he is again put off by the disembodied voice of Peter Parker causing his punch to land just beside Cardiac’s head, crushing the concrete floor instead of the doctor’s face. This diversion allows Cardiac to escape but not before Spider-Man is able to attach a spider-tracer to the fleeing doctor’s ankle. In the aftermath of the battle Spider-Man is collecting his thoughts when he receives a priority one alert from The Avengers. It seems they have noticed his disconcerting and uncharacteristically violent behavior of late. In light of this, Captain America calls for a full battery of tests to prove the identity of this Spider-Man. However this isn’t met with approval, not by a long shot. Spider-Man throws Cap across the room and challenges the entire team to a fight. This is exactly what Peter Parker has been hoping for. Finally Doc Ock’s sinister deed will be uncovered and the process of regaining control over his body can begin. I have to admit that way back in the beginning when the idea of the “body swap” was announced, I was somewhat less than enthused. Although I am a life-long Spider-Man fan and have thoroughly enjoyed Dan Slott’s work thus far, this was sounding like the time to abandon ship. But I stayed through the entire clone saga so I had to at least try to get through this. As it turned out my misgivings and doubts were completely unfounded. This has been one of the most fun and exciting chapters in the Spider-Man universe in quite some time. I love it. Week after week I look forward to Superior as well as Avenging Spider-Man. 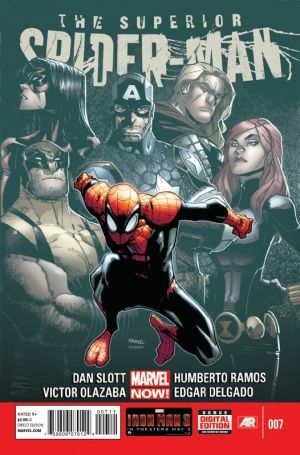 Dan Slott and Humberto Ramos are creating a perfect comic book, not just once but issue after issue. The writing has been flawless. The character of Superior Spider-Man is not merely Doc Ock nor is he just Peter Parker. He is conflicted in a way no other Marvel hero is or could be. He is truly his own worst enemy. Dan Slott has created a perfect anti-hero. Superior Spider-Man does what Amazing Spider-Man refuses to do. He kills, but not indiscriminately. He weighed his options, then he acted but in so doing he opened the floodgates. Now when faced with an opponent who does not deserve such harsh treatment, that thin blurred line is not enough to stay Superior Spider-Man’s hand. He is about to brutally beat a man who albeit by illegal means wants nothing more than to help sick people. These moral dilemmas are skewed when filtered through the mind of Doc Ock and governed over by Peter Parker. Decisions are reached by committee. Dan Slott does a great job of portraying that inner conflict and the helplessness felt by Peter Parker when watching Doc Ock destroy his reputation – but much more than that as Parker watches himself betray that great responsibility that comes with his great power. This is a great time to be reading Spider-Man, not only for the fantastic writing but also for the amazing art of Humberto Ramos. His work is so dynamic and recognizable. His style is so kinetic and alive that it adds a fluidity and movement to his pages. He has also given Superior Spider-Man a look very much of his own. Subtle in some ways but no less unique are the changes to his eyes, hands and feet which make this a new character, not just a new costume. The Superior Spider-Man is an original in every way. I love this book and number seven is a good spot for new readers to jump on. It begins a new story arc and promises to be a turning point in the evolution of the story and the character of The Superior Spider-Man. So until next week see ya at the comic book store. You can follow me here and @bagandbored1 as well as on Twitter @shawnwarner629.